I had so wanted this to be a toddler pose, like in my sims 2 pose, but as of now there are no toddler rig or milkshape files. Hopefully mesher on mts will see this and add some. Also, mesher if you are reading this, some elder and teen ones would be great as well! Also I learned something new about Sims 3 game-play today! The sim in this picture is from one of Sunset Valley's EA houses. You know Sims 3 is a prequel to The Sims 1. 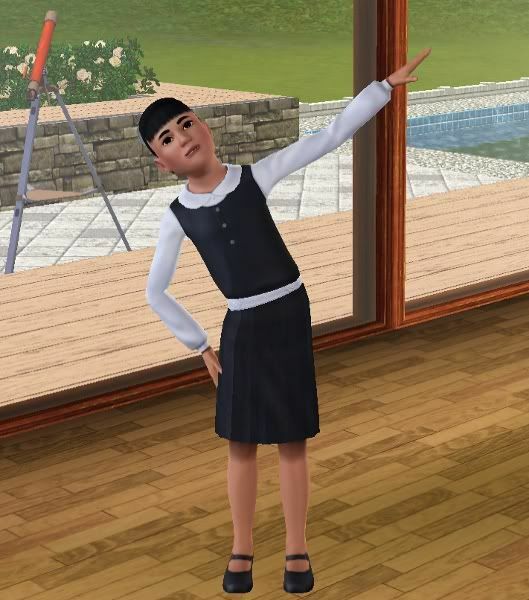 Well this sim's name is Kayllyn Lagganack, or however you spell that name (lol), she is the maid in The Sims 2! You will need cmomoney's pose box on modthesims found here. Once you have that, you can go in buy mode under buy mode/decorative/misc. decor and enter pose by name a_TNW_Pose_5 exactly as it appears here and in the package file name. Enjoy!